I drove through southern Idaho past ranch land and potato fields. Following the path of the Oregon Trail and other Emigrant Trails. Old wagon ruts can be seen here above the Snake River. Map showing the Emigrant Trails. I didn't go to Soda Springs, but thought this was interesting. I stopped for the night at this pretty County Park. Thistle liked the soft green grass, which came at a cost...a thorough cold soaking in the morning when the sprinklers came on as I was trying to unhook to leave. On the grounds was a pioneer museum, complete with the usual old cabin, general store, schoolhouse, etc. These things were my favorite and taught me something new. This type of Sheep Camp was home to a sheep herder from 1800 on. The park was along the swift moving Snake River. The next 3 nights I spent in this National Forest campground near where RV forum friend Sheila lives on the Idaho side of the Tetons. She gave me the most wonderful tour of the area where she grew up. We drove some scenic back roads of eastern Idaho...through fields of bright yellow canola. Past what was once a well-known Ski Resort built in 1940...Bear Gulch Ski Basin. Skiers were transported to the top on a toboggan. We didn't have time to make every stop along this scenic byway, but we hit the highlights. The Henrys Fork of the Snake River squeezes through basalt columns and plunges 65 feet, creating Lower Mesa Falls. This is Sheila, who grew up on the other side of the Tetons in what is now the National Park, and now spends her summers near here in Idaho. The overlook was built by the CCC in the 1930s. Close up showing the force of the water. This area was formed by ancient volcanoes. 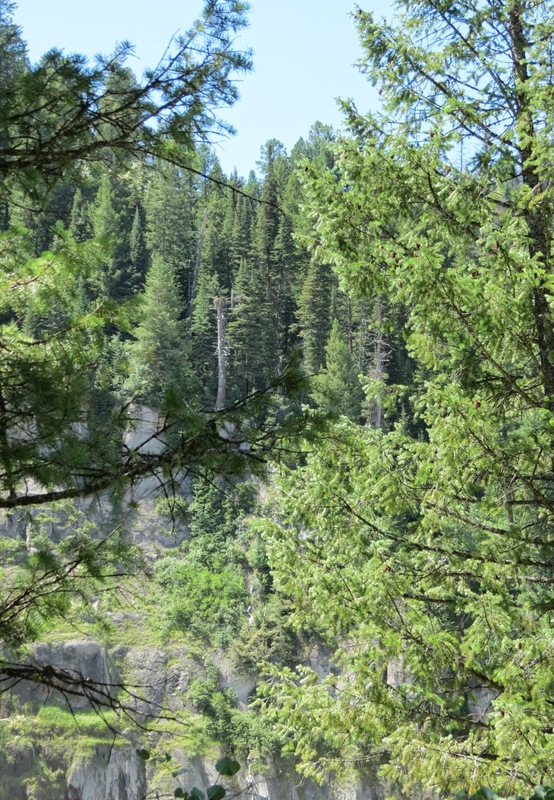 Between 1912 and 1916, the Mesa Power Company built this log building near Upper Mesa Falls. It later became the Big Falls Inn and stage stop. Today it serves as an interpretive center for the falls. 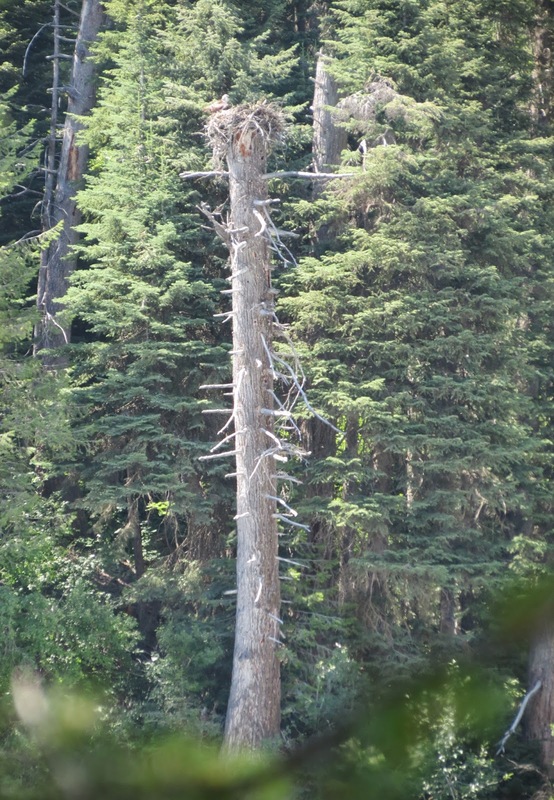 A spotting scope on the porch was set up to show an osprey nest on a tree snag across the river. A colorful butterfly along the trail. Will have to look it up. 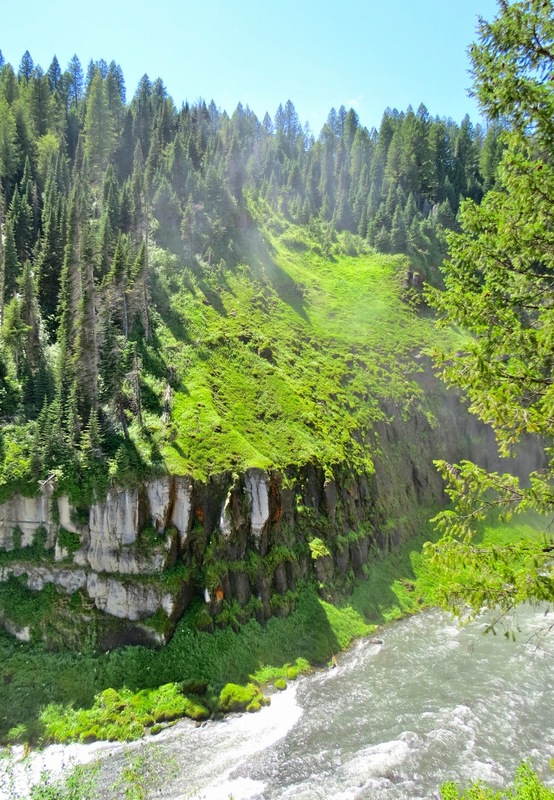 Colorful cliffs across the river below the falls. Over 2.5 billion gallons of water flow over the falls every day! Upper Mesa Falls is 114 feet tall, as high as a 10-story building. The river below the falls. A map of the river. It starts at the top at Big Springs...we'll go there too, and flows through Island Park where Sheila and her husband Larry camp-hosted for many summers, over Mesa Falls and on south to where it flows into the Snake River. The falls flow over compressed volcanic ash, called "tuff," that dates back 1.3 million years. Next stop is Big Springs, the source of the Henrys Fork of the Snake River. 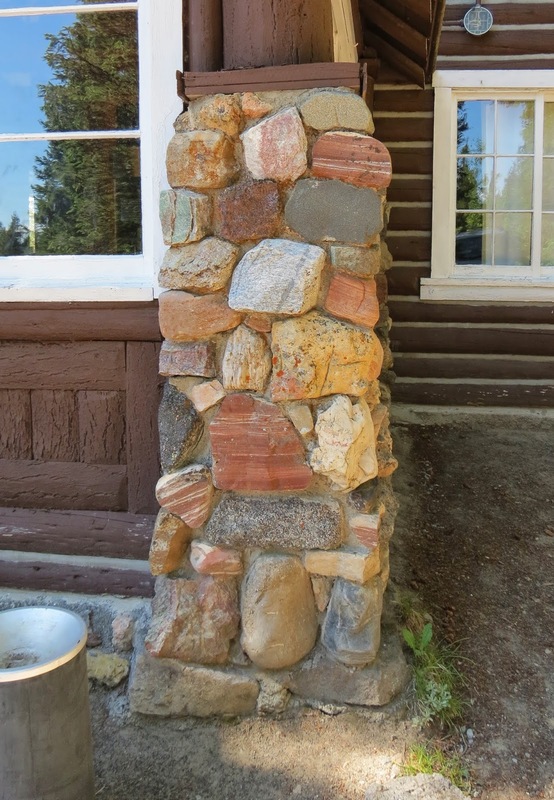 The cabin across the spring was built by Johnny Sack, a German Immigrant, in the 1930s. Peering into the crystal clear spring water. You can see our shadows. Looking down the river from bridge over the headwaters. No fishing allowed in the springs, and the trout grow very large. People on the bridge throw bread in the water. Gulls compete with the fish for it. A photo of Johnny Sack and his dog. Johnny was only 4' 11", and built his cabin to accommodate his short stature. Dining area overlooking Big Spring. He also built his own furnishings. Beautiful wood flooring with a log cabin quilt pattern. Details...bark trim around the light fixtures. Although he was short, he built the ceilings tall enough for normal height people. And he built it large enough for a family, although he was alone. The bark trim was beautiful. One of two upstairs bedrooms. More attention to design and beauty. Back by the spring, the trout are being enticed out from under the bridge with bread crumbs. Often the gulls got them first. We stopped by Coffee Pot Campground where Sheila and Larry used to work-camp, but we didn't get out, so no pictures. I had visited here here once on a previous trip. From there, she took me on a "rustic" shortcut through the woods. This large boulder is seemingly out of place with no explanation. Fortunately it was only this one bad spot, and we made it through ok, even with my low clearance. We ate dinner out at "Boondockers Restaurant." The food was yummy and plentiful. View of the Tetons from the Idaho side. An early "Super Moon" rising over the Tetons. Next up...Grand Teton National Park, on the Wyoming side.